BROWNSVILLE, TN (NOVEMBER 15, 2018) – On Sunday, November 25, 2018, for the second year in a row, more than 700 Museum Stores representing all 50 states and the District of Columbia, 10 countries, and three continents are offering inspired shopping at museums and cultural institutions. 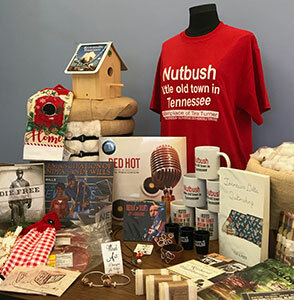 The museum store at the West Tennessee Delta Heritage Center, in Brownsville, is happy to participate in this initiative and invites patrons to shop and support the institution. During this day, as part of Museum Store Sunday, the Delta Heritage Center is offering 25% off select items in the museum gift shop. Eligible items are identified with red dots and each purchase supports the mission and programs of the Center, as well as local artisans. The shop is open from 1-5 p.m. The mission of Museum Store Sunday is of global reach. In partnership with the United Kingdom’s Association for Cultural Enterprises and the Museum Shops Association of Australia and New Zealand, MSA’s Museum Store Sunday aims to be the global annual day to “Be a Patron” — shop conscientiously and support museum stores and their missions worldwide. For more information about Museum Store Sunday at the Delta Heritage Center, please visit www.westtnheritage.com, follow us on Facebook or call 731-779-9000. About the Center: The West Tennessee Delta Heritage Center, in Brownsville, offers a refreshing Southern experience showcasing the history and culture of rural West Tennessee. Inside visitors can learn about the history of cotton, explore the scenic and “wild” Hatchie River and get to know the legendary musicians who call West Tennessee home. Also located on the grounds is the Tina Turner Museum at Flagg Grove School, the childhood school of Tina Turner, and the last home of Blues pioneer Sleepy John Estes. The Delta Heritage Center is also a featured stop along the Americana Music Triangle connecting Nashville, Memphis and New Orleans. To learn more about the Center, visit www.westtnheritage.com or call 731-779-9000. About the Museum Store Association (MSA): The Museum Store Association is a 501(c)3 international organization with the mission of advancing the non-profit retail industry, its museum stores, and the success of the professionals engaged in it. MSA offers educational information and programs throughout the year culminating in an annual conference and trade show highlighting the best in the industry. By advocating for and encouraging high standards of curated products, knowledge, and professionalism, MSA helps museum stores and their non-profit retail professionals better serve their institutions and the public. For more information visit www.museumstoreassociation.org and follow Museum Store Sunday on Instagram and Facebook for more details.